Welcome to another BEST interview. I hope you all celebrated a happy change of years. For this first interview in 2011 we will visit the US East coast, Providence in Rhode Island, to meet Natalie A. Stopka of natalie as is. Hi Natalie! Tell us a little about your shop and your crafting: What do you make and sell? I focus on the tactility of books, their fibers and textures in the hand. I enjoy using vintage textiles as binding elements for their beauty, feel, and sense of history. In my studio I am surrounded by not only vintage fibers, but also vintage tools. My sewing and embroidery are done by hand or on my great-great aunt's 1928 Singer sewing machine, which works like a charm. I've recently restored a Kelsey Excelsior pancake press, and am reassembling a type chest. I have great respect for the bond between a craftsperson and their tools, and the traditions which have been developed over generations of skilled crafting. I am not hidebound in the design of the books I make, but I am mindful that there is always more to learn, and I have reverence for the history of the art form. Using precious textiles and handmade details is a way of reminding the people who handle my work of that history. Do you focus on a specific group of customers? 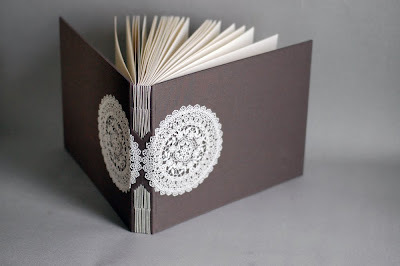 My blank books have found a niche in the bridal market, and I've been working primarily on photo albums, guest books, and custom work. It is really great to work with a couple in designing such a special object for their wedding! During the day I work as an administrative assistant/graphic designer; at night I become a book artist and illustrator. I graduated from the Rhode Island School of Design's Illustration department with a concentration in Sociohistory a few years ago. In addition to illustration, I had the opportunity to take courses in fiber arts and bookbinding during my studies, which I found allowed me to control the entire experience of the book in a wonderful way. I love the idea of creating a complete experience for the viewer, including the words, images, design, and binding of a book. I have been especially fascinated by your various woven designs, since I first saw them. How did you start making them? I gradually developed the woven binding which is a particular favorite through a process of experimentation. I had learned an open spine sewn-to-tape binding in school, which was great but difficult to manage the tension in its sewing. I eventually added coptic and kettle stitches to stabilize the spine, and began thinking of the tapes as both a functional and decorative element. Once I made the leap to weaving the tapes across the covers, I was free to experiment with materials and use the spine as a decorative space. Now I offer the woven book with an open spine or a flat back case binding, using many different vintage fabrics. In the process I learned one of the most important lessons of bookbinding - walking the fine line between utility and decoration in designing a book. Do you have a special way or place to get ideas? When I am working on blank books, my inspiration usually comes from my materials. I enjoy researching fiber arts techniques which can be incorporated in unusual ways - such as embroidery stitches, smocking, dyeing, and other types of fiber manipulation. Working on narrative illustrated books is a more complex and personal process. I often turn to history and mythology for inspiration, but I also pull ideas from my dreams. There is something about dream logic and timing which enliven a story with the unexpected. Whatever I am working on, it is of vital importance that I listen to good music while in the studio! Thank you Natalie for talking with me, and for letting us in behind the scenes of your bindery! If you now want to browse more of her books, and follow up on her work, click on to her Website and Blog, her Flickr Photostream, and of course don't forget to browse the shelves in her Etsy-Shop. Nice to hear about your work and process. Your books and philosophy are very inspiring. I'm amazed at the detail work she does and I've been so impressed by her handwork skills. Your books are truly works of art Natalie! Wow, what very lovely books - I am so excited to see the beading and beautiful textile detail on these; I'm sure there are/will be many very happy couples out there, with amazing guest albums to show! It's great to read about your work and your ideas. I also love old tools and materials (though my "old sewing machine" is only about 30 years old! ).